Finally heading back down from Provin Mountain, we stop briefly by a guy-wire anchor to get a good clear shot of the top of the tower. As would be expected, the channel 22 antenna is on top, with DTV channel 11 lower down. The FM bays up top belong to WAQY. 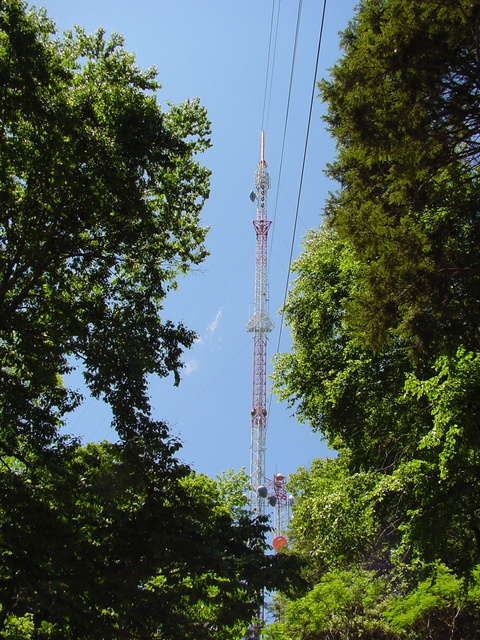 WPKX, as befits a class-A, transmits from a single-bay panel antenna hidden inside red radomes between the first and second levels of guy wires.